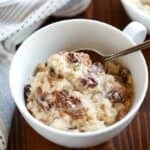 A warm and delicious Baked Rice Pudding recipe made with cooked rice, cinnamon, and raisins. This simple old-fashioned recipe is easy to make and uses ingredients you may already have on hand! Beat the eggs and sugar together. Slowly pour in the milk and cream and mix well. Add the vanilla and cinnamon and mix well. Add the rice and raisins and stir to combine. Pour mixture into a greased casserole dish. Any oven-safe dish will work--you can use one pan to bake at least 9x9'' or bigger, or smaller individualized serving dishes. Place the filled casserole dish inside a larger, oven-proof dish. Add about 2 inches of water to the larger pan (or enough to fill about halfway up the side of the rice pudding dish). This method will help the pudding to have a custard texture. If using a 9x9'' or slightly larger pan, bake for 40-50 minutes or until the top has set (It's okay if it jiggles just slightly). Serve warm. Leftovers store well in the refrigerator for up to 5 days.